Women have played various roles, they play and continue to play all through their lives. A homemaker, life changer, life saver and the list just goes on. Time and again women have proved their power and capability. But why? Why do we still have to prove to the world. Every field, every second, any one of us is ridiculed and discriminated based on our gender, forcing us to prove our worth and capability. Parity is the theme this year. Parity in wages and status. With respect to wages, I believe there is a significant improvement. With regards to status, women are ages away. Women are women’s enemies in some cases. We have the grit to fight against all odds, but our situation worsens when at home you are not supported but instead ridiculed. Equality in status is like a once upon a time story with a catastrophic ending. They say if the end is bad then its not the end. So I, you and we all strive for equality in status and wages. We have a constant fight with ourselves. Our freedom caged inside and our upbringing locking us. Time and again from the cage a bird is freed. When a girl child is born, there is always a small regret , now as I think back , parents previously probably regretted because we demanded “high maintenance “. But when I see the recent parents like for example mine and the parents of 90 born kids, they regret our birth because the grow us up with all the luxuries they can afford and give us nothing less than the best. As the cute little girl of theirs turn out to be a beautiful lady, good looks and kind at heart. Its heartbreaking for them to send off their child and to a place far from known. The anxiety, sadness and disappointment kills them inside as of how should their daughters be, if not better than the present condition at least the same. A silent prayer . But the society and it’s norms have outrun the feelings and the freedom they want their child to have. Newspapers, televisions ,internet and lust filled men they do their job and society’s norms stiffen. I call the leacherous rapists and harassers lust filled men because i don’t know what else to call them. We are bound by stereotypes, first of everything was this statement , ” Let us show our womanhood by dressing up in ethnic wear” I mean seriously? First of all one can wear what they are comfortable or want to anytime. No force. On women’s day we got to break the stereotype surrounded by our dresses. Instead we are urged to drape the Saree. Not a good idea in my opinion. It could be a common color of red or blue or black that has significance. Or an instruction to wear anything they are comfortable in and the wearing must have a strong message. 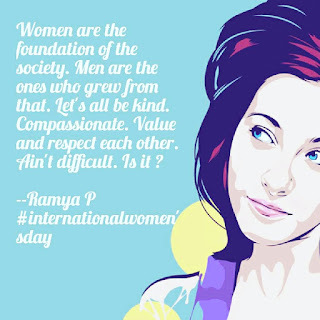 This women’s day let’s all strive to be better human beings. Treating each other as equals itself would bring parity. This Women’s day let us all have compassion in heart and sensibility in mind. Empathize over sympathize and strive to make the world a better place to live. Happy Women’s day to all the women who have made difference in the society.